Prince Albert Pipe Tobacco, in the traditional red resealable pouches, featuring an aromatic blend of coarse cut Burley with Virginia tobaccos enhanced with sweet black cherry flavors. Prince Albert pipe tobacco provides superior consistency, ensuring your smoking pleasure every time. 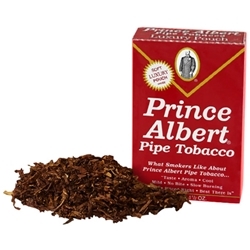 The traditional Prince Albert Pipe Tobacco in the red package. There is nothing else like it. The Prince Albert you buy tomorrow will be exactly the same as the Prince Albert you buy today. That's because strict standards are adhered to in the selection and curing of tobaccos that go into Prince Albert. The next time someone asks you, “Do you have Prince Albert in a can?” you can say, I don’t … but Smokers Discounts does!